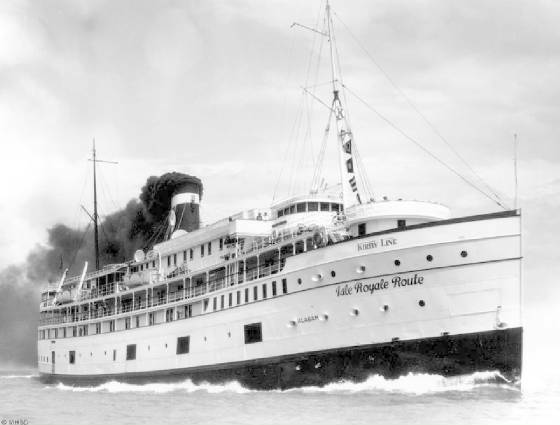 Lone before the U. S. Navy began naming warships after the State of Alabama, at least two popular steamers sailed the Great Lakes under that same name. Both enjoyed relatively successful careers as passenger and freight carriers. The first Alabama on record was a 234-foot wooden side-wheel steamer launched at Detroit in 1848. It operated for only eight years before sinking in Lake Erie while steaming out of Buffalo harbor, apparently bound empty back to Detroit for repairs. The only information we could receive was that the wooden hull was weaked from dry rot, which caused the wreck. The Alabama began sinking shortly after leaving the Buffalo dock and foundered right in the channel. The tug Hamilton Morton removed the ship’s crew. The wreck was an obstruction to navigation so the Navy steamship Michigan made an unsuccessful effort to tow it out of the way. After that divers were used to dismantle the superstructure. By 1855 there was 30 feet of clear water over the sunken hull. The first Alabama’s owners were Burton, Hall & Russell of Sandusky, Ohio, so we suspect this vessel spent most of its time operating between Detroit and Buffalo with stops at Sandusky and ports in between. The second Alabama was launched for the Goodrich Transit Co. of Chicago in 1909. Measuring 272 feet in length, this steamer was licensed to carry up to 2,000 passengers and offered overnight accommodations for 300. It also was equipped to carry cargo below deck. The Alabama’s steel hull was reinforced to make it an ice breaker so it was designed to operate year around, mostly on Lake Michigan. When the Goodrich line went out of business in 1933 the ship was sold to the Kirby Line of Detroit. After that it was chartered to make regular trips from Buffalo, Cleveland, Detroit, Isle Royale and Duluth. As the ship aged it was sold several times to various Great Lakes shipping enterprises. Its final regular operation was to carry passengers from Cleveland and Canada to Cedar Point under the Blue Water Steamship flag in 1946. That fall it was sold to the Chicago, Duluth and Georgian Bay Transit Co. and used as a warehouse at Holland, Michigan. Believe it or not, the old Alabama’s days were not completely over at this point. In 1960 the vessel was sold to a Saugatuck owner who burned off the upper superstructure and used the steel hull as a barge. It eventually was owned by the Stender Construction Co. of Bay City, Michigan which installed a deck crane and used it in marine construction. Then in 1988 the old hull moved to Detroit where it was used for hauling scrap steel for the Ford Motor Co. The remains of the old Alabama were scrapped at LaSalle, Ontario, in 2006.